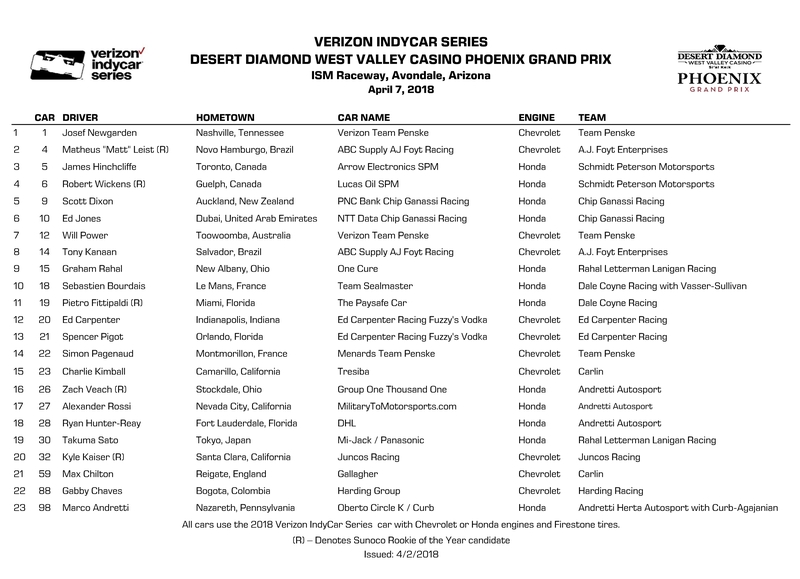 Indy car racing will continue a storied history with ISM Raceway when the Verizon IndyCar Series heads to the oval in Avondale, Arizona, for Saturday night’s Desert Diamond West Valley Casino Phoenix Grand Prix. It will mark the 64th Indy car race at the track, dating to 1964. Legendary names like Foyt, Unser, Andretti, Rutherford, Johncock and Mears have taken the checkered flag at the 1.022-mile oval. 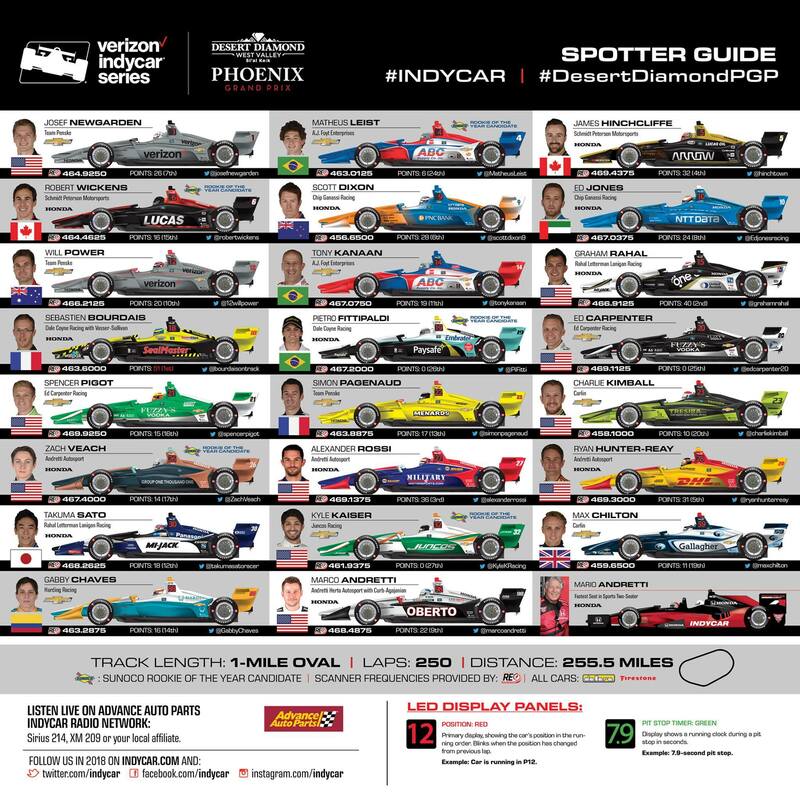 Six drivers entered this weekend, however, will be carving their first slice of Indy car history at the iconic facility originally named Phoenix International Raceway. Five rookies – Pietro Fittipaldi, Kyle Kaiser, Matheus Leist, Zach Veach and Robert Wickens – will make their initial ISM Raceway starts. For Fittipaldi and Kaiser, it will be their maiden Verizon IndyCar Series race of any kind. And even though he’s in his third season, Spencer Pigot is making his first ISM Raceway appearance in an Indy car. “It will be my first race on a short oval since Indy Lights in 2015, so there’s a lot to look forward to,” said Pigot, driver of the No. 21 Ed Carpenter Racing Fuzzy’s Vodka Chevrolet, whose only oval races since joining the Verizon IndyCar Series came at the Indianapolis 500 the past two years. Though it will be his INDYCAR debut, Fittipaldi enters with a legacy to live up to at ISM Raceway. His grandfather, two-time Indy 500 winner Emerson Fittipaldi, won at Phoenix in 1994 in what would be the next-to-last of his 22 career victories. “I used to race ovals with late model (stock cars), but this is going to be my first real open-wheel oval race, so I’m really excited,” said Pietro Fittipaldi, who’s driving the No. 19 The Paysafe Car Honda for Dale Coyne Racing. Neither can veteran Ed Carpenter. Though in his 16th season, the only current owner/driver in the Verizon IndyCar Series is itching to get behind the wheel. Since the 37-year-old competes only on ovals, he hasn’t been in a race for more than seven months. Weekend action at ISM Raceway begins with a one-hour practice at 5 p.m. ET Friday that streams live on RaceControl.IndyCar.com. NBCSN will telecast qualifying live at 8 p.m. Friday, with a final one-hour practice set for 11 p.m. Friday (RaceControl.IndyCar.com). Live race coverage begins at 9 p.m. Saturday on NBCSN and the Advance Auto Parts INDYCAR Radio Network. ISM Raceway is commemorating the 25th anniversary of Mario Andretti’s 1993 Phoenix win – the last of the legend’s 52 Indy car victories – with a host of events throughout the weekend. Among the activities is an invitation-only celebration honoring Andretti on Thursday night in Phoenix, featuring many drivers who competed in the race on April 4, 1993, and other special guests. The program will stream live on IndyCar.com beginning at 10:30 p.m. ET Thursday.